Raksha Bandhan (Rakhi) is a traditional Indian festival in which sisters tie a sacred thread of protection around their brother’s wrists. By accepting a thread from his sister, the brother is bound to protect his sister from harm. The sanctity of the thread that the sister ties to a brother’s hand makes the relationship glow with noble thoughts and blessings of love, devotion and duty of the brother towards his sister. People in India celebrate this festival on the full moon day of the Hindu month of Shravana. The frail rakhi thread is considered stronger than iron chains in India as it binds brothers and sisters in a bond of everlasting trust and love. Sisters apply ‘tikka’ on their brothers’ foreheads and brothers reciprocate by giving them gifts and tokens of cash. In turn, sisters buy gifts and sweets for their brothers. The meaning of this festival has expanded, so those who do not have brothers tie rakhis to others and initiate a new brother-sister relationship that usually continues for a lifetime. This festival also has an important social significance, because it underlines the notion that every one in society should live in harmonious coexistence with each other as brothers and sisters in society. The best way forward towards attaining this social goal is to initiate a lifetime bond that makes men and women, young and old alike with pious feelings towards each other. 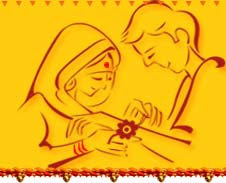 The aim of Rakhi is to achieve a harmonious coexistence for everyone and removal of social strains. Simultaneously, it strives to cultivate noble thoughts in society and imbibe feelings of brotherly as well as sisterly love for members of society. The festival is rooted deeply in the psyche of every Indian since the past. Legend says that Rajput and Maratha queens have send rakhis even to Mughal kings who despite their personal differences, rose to protect them from harm. Another story has it that Lord Indra - the ruler of the heavenly realm, was almost on the verge of losing a long drawn battle against the demons. Indira’s wife came forward to help her husband and tied a talisman on his wrist. This helped Lord Indira win the war against the demons. Yet another legend has it that Lord Yama, the God of death had a sister Yamuna. On every “Shravan Purnima”, she would tie a rakhi on her brother’s wrist. Since then it became customary for sisters to tie a rakhi on their brother’s wrist. There are a lot of rakhis available in the market encompassing both traditional and modern themes. These include thread rakhis, moti (pearl) rakhis, silver rakhis, silver coin rakhis and more. There are rakhis even for children such as chocolate rakhis, Superman, Batman, Pokemon, Krish, Mikey mouse rakhis, and so on. On this day, brothers and sisters send cards and gifts to each other. Traditional gifts mark the occasion. These gifts include rakhi baskets with ethnic stuff, fashion jewellery, gift hampers, ethnic dresses like sarees, kurtis, Punjabi suits, dresses and dress material, traditional puja thalis, Indian Sweets like Kaju Katli, barfi, pendas, boondi laddoos and such, dry fruits such as cashew nuts, raisins, almonds, pistachios, and such. Other gifts include apparels, watches, perfumes, etc other due to the influence of the present day modern culture. On this occasion, brothers also give a token of money as appreciation for their sisters. Sisters also purchase return gifts for their brothers, which includes men’s items such as perfumes, kerchiefs, sunglasses, watches, mobiles, shirts, trousers, wallets, belts, apparels, electronic items, and such. Send Gifts to India - Infibeam.com is an exciting new online destination and community that focuses on selling latest Mobile Phones, Cars, Bikes, Books, Cameras and Send Rakhi to India at guaranteed lowest price.